As Jamie works to get the Lallybroch men ready for war, familiar MacKenzie faces arrive to join the Jacobite rebellion. Get a sneak peek of this week’s Outlander (“Je Suis Prest”), airing Saturday, June 4 at 9:00pm ET|PT on STARZ. But surprisingly, Jamie takes it in stride. 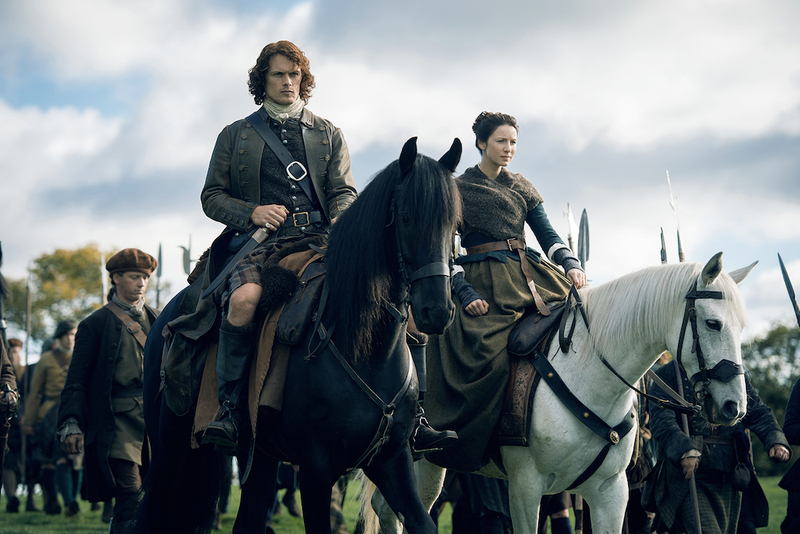 If he has to fight in this stupid war, then he’s determined to win… not because James deserves the throne, but because if the Scots don’t win, Claire has already told him what it will cost the Highlands and his family. Can they change the future? Well, Jamie is optimistic! There were two aspects of “The Fox’s Lair” that stood out most to me. First, I enjoyed learning more about the Fraser family, even if it meant meeting the despicable Lord Lovat. What a horrendous man! But at least, in the end, he decided to send men to support the Jacobites (even if it was for his own selfish reasons… and even if it took some theatrics from Claire as La Dame Blanche). Alas, we have bigger fish to fry, and I’m talking about Culloden. In this week’s Outlander, Dougal MacKenzie and his men are back, including our faves Rupert and Angus! The Highlands are preparing for battle, and Jamie is training his men for the inevitable clash against the British. Meanwhile, the Frasers gain some insightful information from an unlikely source. The episode title takes on a double-meaning. If you’ll recall, “Je Suis Prest” is the Fraser clan motto. It also means “I am ready”, which relates to Jamie, Claire, and the Scots getting ready for their Jacobite war. Unsurprisingly, Murtagh is a tough taskmaster, but these men have a long way to go before they become soldiers that can take on the Red Coats! I’m definitely eager to see what role Claire takes in all this… but I might be more interested in seeing how Jamie and Dougal’s relationship may/may not change. Take a look at 16 photo stills from “Je Suis Prest”, for even more insight into the battle preparations. Remember to come watch the new episode when when it airs this Saturday, June 4 at 9:00pm ET|PT on STARZ. Tune in and come live tweet with @WeSoNerdy!